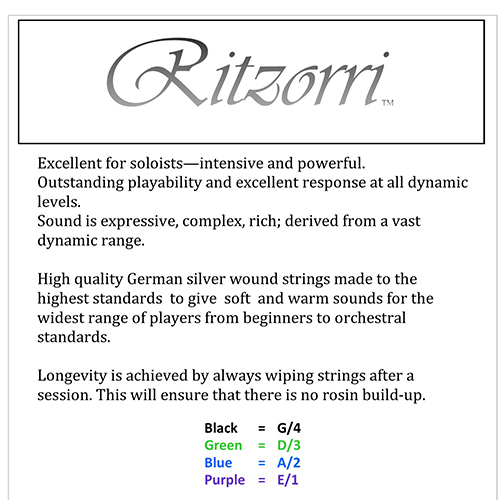 High quality German silver wound strings made to the highest standards to give soft and warm sounds for the widest range of players from beginners to orchestral standards. Outstanding playability and excellent response at all dynamic levels. Excellent for soloists—intensive and powerful. Sound is expressive, complex, rich derived from a vast dynamic range. Longevity is achieved by always wiping strings after a session. This will ensure that there is no rosin build-up. Our strings come packaged in a soft plastic wallet and each string is individually sealed in a cellophane bag. Each of this is numbered for easy indentification. We have a responsible attitude towards recycling and sustainability. For instance the outer packaging was deliberately designed so that it can be reused as a CD wallet thus ensuring a long and useful life. GUIDE TO CHANGING VIOLIN STRINGS - Simple Steps! You will need your violin and your new set of strings. Whether you are a beginner or you have an expensive instrument you may want to lay down a towel/blanket on a flat surface such as a table. We will outline how to change all the strings but of course the principle applies to individual strings too. A. Get all your new strings ready. Separate them out in the order G, D, A, E. Have your violin by your side too. B. When we change violin strings it is usual to start with the G string first, but this is not the law! Unwind the peg at the top for G string only, and remove the string slowly. Note: Remove the G string only, and leave other strings in place. REPEAT: Do not remove all the strings at once. Here is the reason. The strings effectively press down on the bridge which in turn presses down on the body which applies pressure to hold the soundpost in place inside the violin. Take off the strings and you will find that the soundpost falls out of position. The sound post is not glued in place and is merely held in place by the mechanical pressure of the strings. End of interesting background info. C. With your new G string in hand, insert the top end of the string into the peg. At the bottom, insert the ball end of the new G string into the tailpiece. Both sides of the new G string are secured in the violin but not tightened. Don't worry if the ball end keeps popping out initially, as the peg end is tightened the reduced length of the overall string will hold the ball end in place. D. With right hand on the slack G string, and left hand on the peg, turn the peg 'away from you' to tighten the string. Turn the peg slowly, and lower your right hand with the G string, onto the fingerboard, until the G string rests on the violin bridge. E. Now, the string is slightly secured and tightened, but is not tuned to the right note. Now is the time to get your tuner and tune the string correctly. F. Once the G string is changed and tuned, you can move on to change the D string by repeating the steps above. Repeat the steps until all strings are changed. After you have changed your strings you will find that the violin will need retuning for the next day or two. This is normal and it is just the strings 'settling' in. TOP TIP : Do not throw away the old strings if they are not broken - Most old violin strings can still be used and played and could get you out of a sticky situation should and emergency arise, say, just before an important session/performance. Of course you can always keep a new set of strings as spares instead. Here we show a closeup of how the string should be wound on the peg. Obviously the peg is out of its normal position for the purpose of the picture. The thing to note is that the end of the string is wound over and is thus gripped into place. While you're turning the pegs to tighten the strings, look at the strings winding around the peg. Make sure they are wound properly and tidily. This will help you secure the strings, and make tuning easier later on. Do not turn the pegs too fast while you're fastening and tightening the strings. This is especially important for new violin strings. New strings have not been stretched, hence, turning too fast might risk breaking them. If you break the violin string(s) while you're tuning, don't fret, this has happened to all violinist at one time or another. It's okay. Get a new string and try again. You will be better next time. If you face any difficulties when you change violin strings, such as securing the strings, turning the pegs…etc, get a professional to help you. You do not have to wait till your strings break or unwind before you change violin strings. The more you play, the faster your strings will wear off. Hence, concert violinists do change their strings frequently, some as much as bi-weekly or com change violin strings frequently to prevent them from breaking at crucial times such as live performances. If the peg keeps slipping then apply a bit of wax on the peg and peg hole and this will give a good grip. You may want to rub some pencil graphite on the strings where they touch the bridge and nut. This reduces wear and prolongs string life. 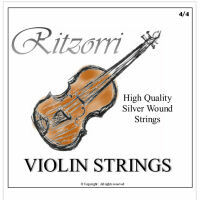 These strings give a surprisingly good tone and easily out-performs strings that cost 4 x more. It's like I have got a new violin. My fellow players will be ordering some too.